The Shakespeare Company’s season opener Romeo & Juliet ran Oct 1 – 17 at Vertigo Theatre’s Studio. 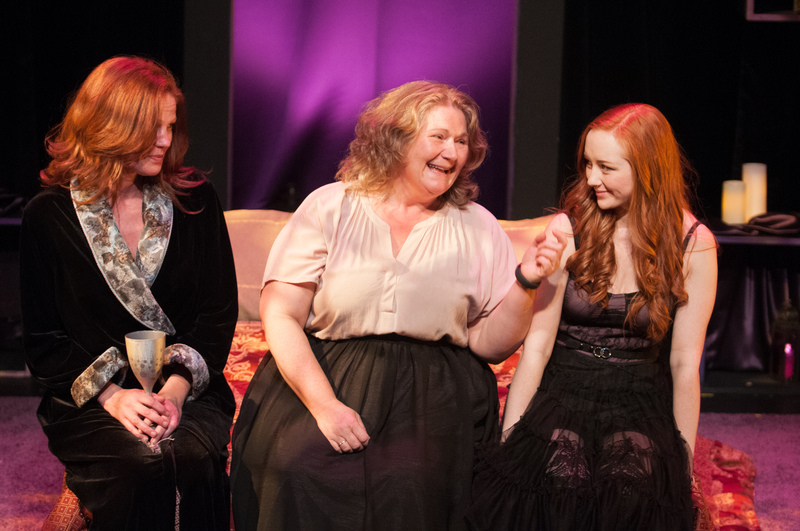 Pictured: Lady Capulet (Chantal Perron), Nurse (Elizabeth Stepkowski Tarhan), and Juliet (Allison Lynch). Photo Credit: Ben Laird Photography. To this day, William Shakespeare’s Romeo & Juliet continues to be read in nearly every high school across the country. Students read aloud the play, dissect its themes, then clumsily stage the famous balcony scene as part of their final project. And so, by this point in time, there are very few who are not familiar with Shakespeare’s tragic love story, making it all the more challenging to stage. In their mind, audiences already know what to expect from Romeo & Juliet because the play is so well-known. The question then arises: how does one defy expectations and make Romeo & Juliet feel new once again? Director Ron Jenkins answers that questions very well, thanks to a keen eye and stellar cast of actors. Many will say that the feud between the Capulets and Montagues is what ultimately kills Romeo and Juliet, played by Eric Wigston and Allison Lynch, while others blame the irrational, hasty behaviour of its two main characters. Both are true, but it is the latter that Jenkins is truly concerned with in this production by The Shakespeare Company. Here, Jenkins is not so interested in presenting the play as a tale of mean old adults versus unfairly treated teenagers. Instead, the director explores youth as a turbulent time where everything seems like the most important thing ever. That sort of immediacy is demonstrated best in Romeo, a mopey teen who’s made dumb by what he perceives as true love. Wigston’s physicalities are big and oozing with passion (and hormones). The actor is particularly wild during the balcony scene, which he and Lynch play wonderfully. Wigston’s Romeo is reminiscent of Dustin Hoffman running away with Katharine Ross at the end of The Graduate, except he never reaches the bus. Wigston displays the sort of optimism that thinks love prevails in the end, even against an ancient family feud. Of course, love doesn’t save Romeo and Juliet, because the feud is not only very real, but it is also very violent. The violence is well affirmed by Fight Director Karl Sine’s tight choreography. On top of being dreamy, Romeo is also a big dreamer. Lynch plays Juliet as level headed as any 13 year old can be at that age. Because of Romeo, however, Juliet becomes a dreamer, too. We see Lynch, every so tenderly, make that journey from infatuated to completely swept up in Wigston’s enthusiasm. When everything falls apart at the end of the first act, we see Lynch play a tortured girl with no exit with tremendous force. Juliet’s Nurse, played by a delightful Elizabeth Stepkowski Tarhan, is not blameless in this whole affair. Per this interpretation of the play, Juliet’s Nurse almost seems to play along with Romeo and Juliet, humouring them almost. In doing so, she becomes absorbed in their youthful spirit. And so, it is all fun and games until the gravity of the situation shakes the Nurse out of it and snaps her back to reality. Jenkins offers plenty to chew on in this production of Romeo & Juliet, especially with the gender cross casting of Benvolio, played by a fierce Amy Burks. The play becomes more than about forbidden love, but the perils of being a teenager in a loveless world. Watching this production, how often do youth go astray because they feel that cannot confide in their parents? What happens when inexperienced youth are left to figure out life themselves? A lot, and sometimes they are things that cannot be undone. The layers of depth Jenkins pursues are brilliantly staged in this refreshing production of an old classic. Jenkin’s confidence as a director is on full display from top to bottom. Those looking to fall in love with Romeo & Juliet again will want to catch this spirited production by The Shakespeare Company. The Shakespeare Company’s production of Romeo & Juliet ran Oct 1 – 17 at Vertigo Theatre’s Studio.